WARNING: Spoilers for “Game of Thrones” season six. There was a lot to love in the final episode of season six. The Tower of Joy flashback, Jon Snow is now King in the North, and the deaths of at least five major characters when Cersei lit the wildfire beneath the Sept of the Baelor. 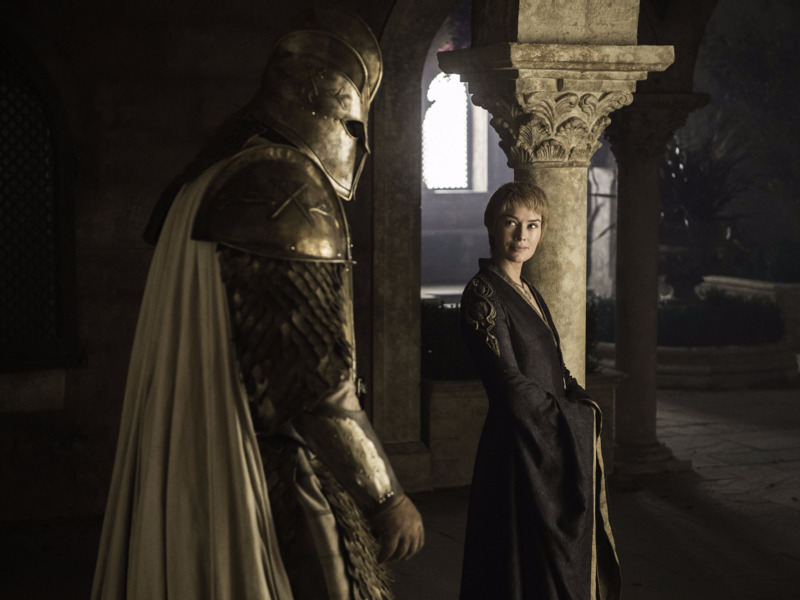 Episode 10, “The Winder of Winter,” was shocking and epic, but there was one lesser character’s comeuppance that some fans were thrilled to see — the torture of Septa Unella at the hands of Gregor Clegane, aka the Mountain. Unella was a devoted follower of the High Sparrow and a septa of the Faith of the Seven. Described as big boned and homely in the books, Unella is shown as Cersei’s chief tormenter both during her imprisonment in the Great Sept of Baelor as well as during her walk of shame. Unella would visit Cersei in season five in her cell and would torture her by offering a ladle of water on the condition that she confess. Cersei, infuriated by Unella, tells the septa that her face will be the last one she sees before she dies — though it was an empty threat then, it certainly wasn’t now. Eventually, Cersei confessed to her adultery and was allowed to return to the Red Keep, but only after she walked naked through King’s Landing as a sign of her repentance. The entire walk, Septa Unella talks behind her crying out “Shame!” while ringing a bell to attract the attention of the people of King’s Landing. 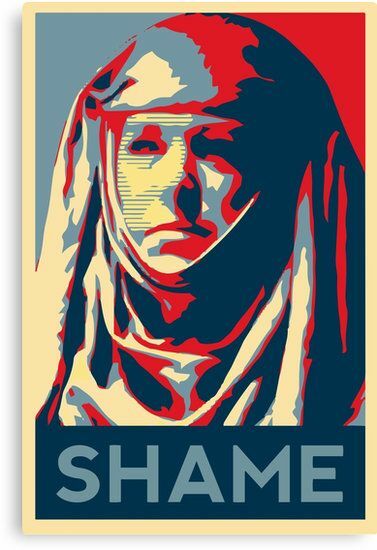 This scene even became a bit of a meme across Reddit and Twitter as fans began using the image of Septa Unella or a GIF of her saying “Shame” over and over again in season five. The last time we saw Unella, she had been assigned to watch over Queen Margaery non-stop in the Red Keep. It appeared the Faith had finally won and were in charge in the Red Keep and King’s Landing. And now, her change of fortune could not have been more pronounced. 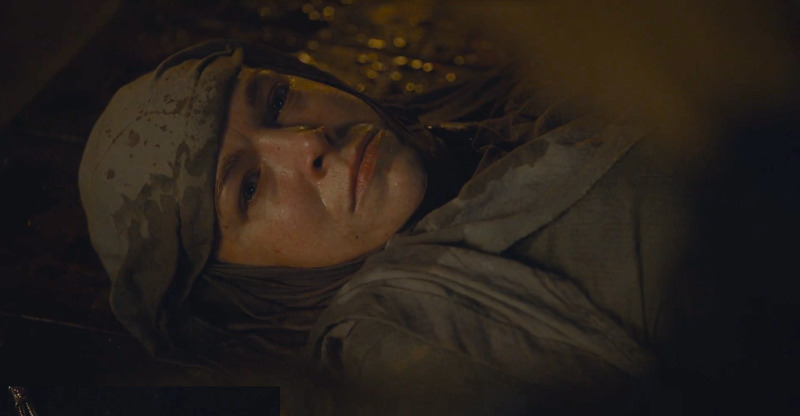 In episode 10, Septa Unella awoke to Cersei pouring wine all over her and asking her to confess, much like she had asked Cersei repeatedly to confess while she was imprisoned in the sept.
And then, the death knell: “I said my face would be the last thing you saw before you die, do you remember?” she asks the septa. Though Unella at first believes this is a good thing — that Cersei will kill her quickly and she’ll be able to meet the gods — it didn’t quite work out that way. Enter the undead Mountain, Ser Gregor Clegane. Unella can only look on horrified as he walks into the room. 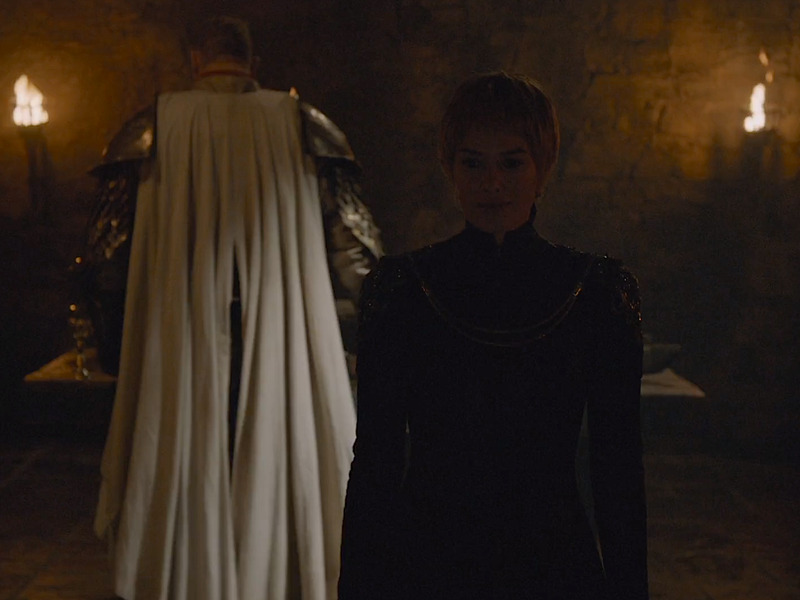 “The gods have forsaken you,” Cersei tells her. “This is your god now.” She then walks out saying shame as Septa Unella screams in the background. Many, many fans were riveted to finally see the holy septa terrorised by Cersei and to watch her reversal of fortune. Fan service revenge tactics going on right now. Waterboarding Septa Unella with wine…really HBO? Really? “My face will be the last thing you’ll see before you die.” LOL! And while it was a truly shocking scene to watch, Lena Headey who plays Cersei told Entertainment Weekly the scene was almost much more graphic. 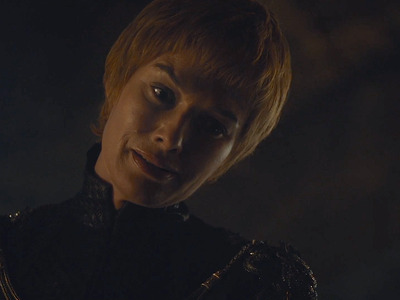 Though it was a smaller moment among many, many other deaths during this finale episode, it was satisfying in a way to watch Cersei keep her word to the unmovable septa.